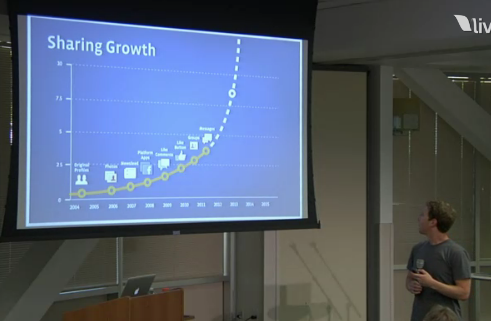 Facebook’s Andrew Bosworth: "The Most Exciting Things Are Things We’re Not Working On"
At yesterday’s launch of video Skype messaging, Mark Zuckerberg showed this slide of Facebook user growth graph plotted with the launches of Facebook apps like Photos, Messages and the Like Button. Zuckerberg held that each bump in growth was fueled by a technological innovation and that as sharing moves further along the curve he is waiting for the technological innovation that will propel it upwards. When asked in the above interview what this innovation could possibly be (Project Spartan, perhaps?) Facebook Director of Product Engineering Andrew Bosworth gave a somewhat surprising answer. “Certainly we have some ideas and obviously some things we can’t talk about. But a big part of what Zuck wants to do is enable people in the world, not just at Facebook but anyone who wants to be the next bubble on that law of sharing graph, to build those things. 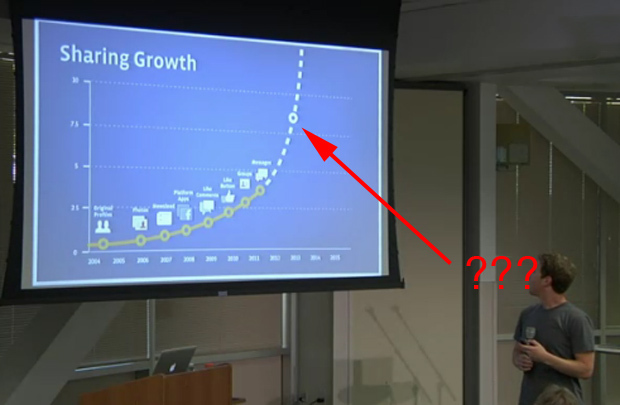 For the perspective of someone who is aiming for one of those bubbles, check out this post-announcement interview with Skype’s Head of Consumer Product & Design Rick Osterloh, where he talks about the user growth benefits of building on the Facebook platform, among other things.